NASCAR Camping World Truck Series (NCWTS) team, Copp Motorsports is proud to announce its partnership with E2 Northeast Northeast Motorsports and Florida-based driver, Scott Stenzel for the season opener at Daytona International Speedway. It all started on dirt for the 37-year-old who was raised in southern Minnesota. With perseverance and a dream, Stenzel has found himself competing in the ARCA Racing Series, NASCAR K&N Pro Series East and the NASCAR Camping World Truck Series (NCWTS). With a knack for high banks and drafting, Stenzel is eager for his first NCWTS start at the famed 2.5-mile tri-oval in the No. 83 E2 Northeast Motorsports Chevy. �I have sincerely been blessed with the opportunities I have had in motorsports. It has allowed me to live my passion and my dream of being a professional race car driver. To start a race in one of NASCAR�s premier series at Daytona will be a dream come true. I look forward to working with DJ [Copp] and his team as we prepare to tackle Daytona under the lights�. About E2 Northeast Motorsports, Inc: Based out of upstate New York, E2 Northeast Motorsports, Inc. is a developmental race team with interest in NASCAR's Whelen All-American Series and Camping World Trucks divisions. The historical team is owned by successful entrepreneur, Melissa Harville-Lebron. 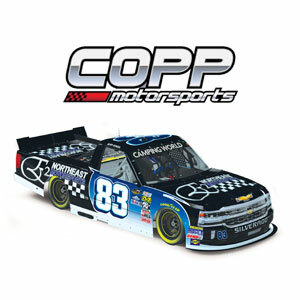 About Copp Motorsports: Competing in their second consecutive season in the NASCAR Camping World Truck Series, Copp Motorsports fields the No. 83 Chevrolet. Owned and operated by NASCAR over the wall veteran and New York native, DJ Copp. In 2017 Copp Motorsports earned their first top-10 at Phoenix Raceway and in their last superspeedway (Talladega) effort they finished 13th. After a strong run at Talladega last year, MB Motorsports is heading to the world�s fastest superspeedway as a two truck team. Scott Stenzel will drive the #63 Mittler Brothers Machine & Tool / ShowcaseOfCars.com / Eagle Rock Camp Chevy Silverado. Race fans can help Eagle Rock Camp reach their goal by visiting www.eaglerockcamp.org and using the donation button to support this worthy cause. You can follow Eagle Rock Camp on Twitter, @EagleRockCampWW or visit www.eaglerockcamp.org. Eagle Rock Camp is a 501 ( c ) 3 non-profit organization. MB Motorsports is one of the original teams in the NASCAR Camping World Truck Series, having competed in every season since the series debuted in 1995. The team has given many young drivers their start in NASCAR, including Sprint Cup Series winners Carl Edwards, Jamie McMurray, Brad Keselowski and Regan Smith. You can follow MB Motorsports on Facebook and Twitter, @MB Motorsports Facebook or visit @MBMotorsports. Founded in 1980, Mittler Bros. Machine & Tool manufactures metal fabrication tools, racing products and industrial automation systems. Many race shops across the country utilize Mittler Bros. tube notchers and benders, bead rollers, bench presses, box pan brakes, planishing hammers and English wheels. Its� Tanner Racing Products By MB offers wheel scales, pull down rigs, pivot jacks, quarter midget and go-kart parts, as well as tire management tools. Mittler Bros.� Industrial automation products include the Chipmaster Chip Packing System, CNC Machining, robotic integration, industrial automation equipment, contract machining and engineering design services. For more information on the Wright City, MO based Mittler Bros. Machine & Tool, visit www.mittlerbros.com. You can also follow their Facebook and Twitter pages. MB Motorsports Press Release - August 28, 2014 - MB MOTORSPORTS: A Weekend Of Firsts At CanadianTire Motorsport Park When you�ve been in the NASCAR Camping World Truck Series since its inaugural season, you don�t often get the opportunity to race at a track you�ve never been to before. That, however, will be the case for MB Motorsports when the team unloads the #63 Personal Comfort Bed / Mittler Brothers Machine & Tool Chevy at Canadian Tire Motorsport Park for the Chevrolet Silverado 250. The race will also be the first time the team has raced outside the U.S. 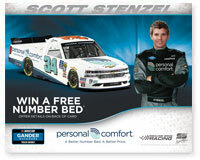 The Chevrolet Silverado 250 will mark Stenzel�s third start of the season and his first attempt on a road course. �This is our first race with Personal Comfort Bed on board the MB Motorsports Chevy, so I want to make them proud and get them as much exposure as we can. I�ve done everything I can to prepare for this race,� says Stenzel. MB Motorsports will also be joined by its marketing partners LG Seeds and Excel Bottling Company / Ski Soda. The team also continues its support of Eagle Rock Camp. You can get live updates from the team during the race by following @MBMotorsports on twitter. Owning a Personal Comfort Bed is like owning every mattress on the showroom floor. You can easily personalize your mattress to make the it more firm or more plush depending on your body�s needs. If you are a couple struggling to find a mattress for both your needs Personal Comfort Bed can help. If you like it plush and they like it firm it�s easy to make an adjustment. The Personal Comfort Bed is made up of patented and state-of-the-art technology. Our remotes use a medically recognized pressure scale, we are the only mattress in the industry that has a reversible top cover with a cooling more ventilated fabric for the spring and summer and a more comforting side for the fall and winter months. All of our beds area completely inter-changeable, upgradeable and renewable. We are owned by an FDA registered medical device manufacturer. LG SEEDS is a brand of AgReliant Genetics, LLC, the third largest corn seed company in the USA. LG SEEDS offers corn, soybean and alfalfa seed to farmers throughout the Corn Belt. LG SEEDS� headquarters is located in Elmwood, IL. LG SEEDS is committed to working with the farmers we serve and is dedicated to delivering the results they demand. We believe in a simple formula: Our Seed. Your Soil. Total Success � offering unique genetics while working hard to understand each farmer�s unique needs and helping to achieve the highest yields possible. Excel Bottling Company produces flavored soda using cane sugar, returnable bottles, and vintage bottling equipment. The county's favorite soft drink, Ski, was added in 1961 and accounts for the majority of soda produced. We are one of a few remaining "mom & pop" bottlers left in the nation and the only returnable bottling line left in Illinois. Aside from bottling soda, the plant produces syrup for use on fountain equipment. A faith-based, holistic sports camp where military families learn to re-connect and re-integrate. Their secluded setting, free of the distractions daily life, allows warriors with both invisible and physical wounds to re-learn old and learn new sports skills. The entire family learns life skills that provide positive, life changing experiences so they can recharge their energy and spirits, while learning to live life better and enhance family relationships. Eagle Rock Camp is a proud member of R4 Alliance, a membership of programs of excellence providing therapeutic and community based recreation services to Our Military Family. R4 is focused and committed to achieving the highest quality services through collaborative efforts in research, education, and standards of excellence, economic viability, and continuum of care across our service community. We believe these services are essential to the holistic Rehabilitation and Reintegration of Our Military Family. MB Motorsports Press Release - October 15, 2013 - MB Motorsports and Scott Stenzel are heading to Talladega Superspeedway, looking for redemption, after mechanical issues kept them from making the season opener at Daytona. Stenzel will be behind the wheel of the #63 Yellow Stripes: Making The Driver / Mittler Brothers Machine Tool Ford. The fred's 250 will mark Scott's first series start at Talladega, although he did score a top ten finish (7th) in the 2010 ARCA race at the famed speedway. After mechanical gremlins derailed their attempt at Daytona, Stenzel and the MB Motorsports crew are taking no chances in preparing for Talladega. "Sometimes, no matter how prepared you are, the mechanical gremlins bite you," notes Stenzel. "That's what happened to us at Daytona and we just missed making the race. Adds team owner Mike Mittler, "If we normally triple check everything on the truck before a race, for Talladega, we're quadruple checking. We've got John Monsam back as crew chief for the fred's 250 and he's no stranger to Talladega." Says Monsam, "This will be our third race together and we're communicating better as a crew with each race. Scott has run well at Talladega, so I think we're in a pretty good position for Saturday's race." Adds Stenzel, "We've got Greg Biffle's spotter, Joel Edmonds, with us for Talladega. Having a Cup spotter with us is a big advantage, especially when you're running in the tight packs that we invariably end up in Talladega." �Scott has done a great job for us each time we've raced together. He races clean, stays out of trouble and takes excellent care of the equipment. He's very good on super speedways, so I'm looking for a good Saturday at Talladega." �Talladega's a place where you need to be prepared, you need to be fast and most importantly, you need to be lucky. We can control the preparation and make the truck as fast as we can. Scott knows his way around the track. If we all do our jobs and we can manage to be in the right place at the right time, we should all be happy come Saturday night." MB Motorsports Press Release - June 5, 2012 - MB Motorsports will give Scott Stenzel his second NASCAR Camping World Truck Series start June 8th at Texas Motor Speedway driving the #65 Chevy Silverado for Mike Mittler. The team successfully made their first 2012 start, and finish, at Kansas Speedway in April and look forward to carry their momentum to Texas. "This race is going to be the longest race I have ever raced," states Stenzel. "Mike and the crew have been working overtime making sure everything was triple checked before we unloaded." The move to a Chevrolet paid off at Kansas and continues to prove to be a formidable effort as the team sets up for Texas. "We have a great truck and a great driver. I feel confident about our effort and preparation for Texas," exclaimed Mike Mittler, Team Owner. This will mark the second MB Motorsports race powered with a Chevy Silverado in 2012. MB Motorsports Press Release - April 24, 2012 - The MB Motorsports team has been around since 1995 and has a lot of past success stories. After missing the first two races of the season it was time for a change. Like any successful business MB Motorsports knew when it was time to redesign their formula for success in order to compete at today's level within the NASCAR Camping World Truck Series. The SFP 250 at Kansas Speedway was a first for many things for the MB Motorsports organization. This marked the first race the team qualified for during the 2012 season, the first race with a Chevy Silverado, and the first race with rookie driver Scott Stenzel. "We defined a victory this week by setting achievable goals for the team," stated Mike Mittler team owner, "Our first goal was to make the race and our second was to finish the race. Today was a victory for MB Motorsports." After qualifying 32nd the #65 Making the Driver Chevy Silverado was in the race and one goal was achieved. MB Motorsports achieved their second goal, ending the weekend victorious, when Stenzel piloted his way through the field to finish 23rd as he took the checkered flag. "Working with this high of a caliper of a race team has given me the confidence to push harder and focus more," said Stenzel. "We accomplished our goals as a team this week and hope to carry that momentum into the future." The next MB Motorsports race event is yet to be determined. MB Motorsports Press Release - April 18, 2012 - Have you ever wondered what it would feel like to follow in the footsteps of a great athlete? How big the imprint may have been left behind? How much more pressure one would face? Any doubt must be left behind as the moment of truth falls onto a new rookie driver following in the footsteps of NASCAR's Sprint Cup driver, Carl Edwards. There is a lot to be said about the journey to the top of any athlete's career. This driver's particular journey has left a trail of yellow stripes for others to follow. Ever wondered how to make it into the big leagues of motorsports? Yellow Stripes Making the Driver is a documentary that has molded an aspiring driver into an official NASCAR race car driver. Charlie Patterson, the agent, scouts out new racing talent and molds them into great race car drivers. Patterson�s company, NexGen Motorsports, has been working with rookie Scott Stenzel for the last four years and has experienced successful runs in that time. One of Patterson's recent achievements was bringing Stenzel to Mike Mittler, owner of MB Motorsports. "In my 51 years of racing I have never met a driver that has so many of the traits I look for in a driver from Scott's skill to marketability I'm thrilled and excited to be at this level with him," commented Patterson. "I feel comfortable bringing Scott to Mike Mittler, a premier truck series owner, they should be able to achieve great results." Charlie has had past success with MB Motorsports, including pairing them with the late Kenny Irwin, Jr.
MB Motorsports has a rich racing heritage and a deeply rooted tradition of finding and developing young athletes into Championship caliber race car drivers. They entered the NASCAR Camping World Truck Series in its inaugural season in 1995 and have competed in the series every year since, making them the oldest and longest running team in the series. MB Motorsports has helped shape the careers of drivers including Carl Edwards, Brad Keselowski, Jamie McMurray, Regan Smith, Justin Allgaier and Kenny Wallace among others. Mike Mittler, President and GM of Mittler Brothers Machine & Tool, has dedicated his life to achieving greatness on and off track. MB Motorsports has been racing Ford F-Series trucks since they first took to the track in 1995, but will arrive at Kansas Speedway fielding a Chevy Silverado. Mittler had this to say about the change, "The opportunity presented itself to us and it was a win-win deal. The last two races we have not had that much luck running the Ford program, so we felt this may be the change we needed to regain our momentum." The black #65 MB Motorsports Chevy features a chassis from the KHI stable and a brand new motor from PME to furnish some fresh smoke in the hopes for a great combination. To finish it off will be a fresh coat of paint to ordain those infamous "Yellow Stripes" on the rear bumper. "Bringing new talent into the sport is what I do," Mittler states, "with Scott, there is no question about his talent. It's the addition of having a background in advertising and marketing that makes our relationship even stronger. When I went to the making the driver website and heard Scott's story I had a desire to help him accomplish his goal together." The goal set forth in the Yellow Stripes program is to take a rookie driver to Daytona. The journey there must start small and that's where Mittler is excited to assist in this effort. Before taking to a NASCAR event at Daytona it's very important to race with the same group of people on a smaller circuit and Kansas just so happened to be that circuit. Drivers here get a great sense of speed along with aero experience and incredible g forces. Following in the giant footsteps of Carl Edwards can be quite intimidating as a rookie coming up through the ranks. "Finally, a once in a lifetime opportunity has came to pass," Stenzel remarked, "knowing there are people out there still willing to do something great in this world means more than anything to me. Mr. Mittler has offered to give me a shot, all I can think to myself is I better not screw this one up!" Interestingly enough there is some previous history between Scott and Carl. He had met Cart at 2004 Daytona 500 while "stilt walking" for the event. In order to be seen you have to take extreme measures, in this case it was standing 10 feet above everyone. Carl had invited Scott and his crew back to hang out at the motor home where they shared in conversation and left unknowingly that they'd be crossing paths in the near future. During Scott's first NASCAR K&N Series debut he had the pleasure of working with Carl's spotter, Jason Hadlesky, where he kept him out of trouble and helped coach him about the lines and traffic at race speeds. Now, Scott will make his NASCAR Camping World Truck Series debut in a truck owned by Mike Mittler, the very same man who gave Carl his first series start. Adding to these interesting coincidences, it was none other than Carl Edwards behind the wheel for MB Motorsports when the NCWTS made its debut at Kansas Speedway. "It's an honor to race for MB Motorsports and to have Mike Mittler as crew chief. His history of helping mold great drivers gives me the confidence I need when at the race track," says Stenzel. "Our main focus this weekend is to qualify the truck in the race. To us that's a huge win. Anything else that happens will be just icing on the cake." In order to prepare for his big NASCAR debut Scott has put in countless hours behind the wheel of his sim racing cockpit at the comfort of his home. There he's been training with the pros at Sim Factory on their new beta version of trucks at Kansas Speedway as well as some iRacing with his racing buddies. "Whatever you can do to get the seat time you need before any event is important. Not only does it help you get comfortable with the visual points on the track but it also gives you that added confidence when you finally get behind the wheel," states Scott. MB Motorsports marks their 11th attempt at Kansas Speedway as they register the #65 Making the Driver Chevy Silverado. Qualifying for the SFP 250 at Kansas Speedway begins April 21st at 9:30 AM Eastern and coverage begins at 1:30 PM Eastern live on SPEED. DAYTONA BEACH, Florida (January 18, 2011) - - Redemption was the name of the game for Scott Stenzel driver of the No. 42 Yellow Stripes Making the Driver Ford Fusion. After the last single car session, on Tuesday, Stenzel posted a sixth place time of 49.457 and was the highest placing Ford. One year ago Stenzel was setup to attempt his first ARCA Racing Series start powered by Roush Yates Engines and fielded by Spraker Racing Enterprises. During qualifying for the 2010 Lucas Oil Slick Mist 200, Stenzel made light contact with the turn three wall which ruined his chances of making his first start. Following the disappointing Daytona heartbreak, the team gathered themselves back together and was able to successfully capitalize on a seventh place finish at Talladega (Ala) Superspeedway after participating in the open test and qualifying in the 28th position for the race. The Yellow Stripes team was optimistic coming back to Daytona International Speedway after the teams' success at Talladega. "With this new track surface we figured we'd be at least as fast as we were at Talladega," said Scott Stenzel. "But had no idea after that first session on Tuesday that we'd be posting a time of eighth quick." During the afternoon session Spraker Racing continued to shine as the team fielded the No. 42 car for two rookie drivers to gain some valuable seat time. Joey Gase (42b) posted 23rd with a lap time of 50.048 and Ryan Lynch (42c) posted 27th with a lap time of 50.080. "It was great to give these guys some experience at high speeds. For never turning a lap at Daytona they both showed they can be competitive," added Stenzel. Wrapping up day one with only a few qualifying runs didn't give the team all the data they needed to be confident for their return in February. Jeff Spraker made the call to stay for Wednesday morning practice and it sure paid off. Spraker Racing made some significant adjustments to help get the car through the air better at these speeds, sent Stenzel back out on the track, and posted a top-three position immediately. After making further adjustments the No. 42 Ford Fusion settled in at a comfortable sixth place position at a time of 49.457 with a speed of 181.976 miles per hour. "We fulfilled our test agenda and we are pleased with the results. In addition to helping Joey Gase and Ryan Lynch a chance to gain some valuable track time, we discovered some more speed in the car and really helped enhance Scott's confidence and prove that we have a very competitive effort here," said crew chief and team owner Jeff Spraker. "Between the great support from Roush Yates and Spraker Racing we are into Daytona with a great package." "Now that we were able to prove we have a good piece it�s time to get out there and keep this momentum going by seeking sponsor partnerships. We have a lot of irons in the fire but any bit can help as we don�t have enough sponsorship to keep going," Stenzel reluctantly added. "Clearly we can�t stop now as we�ve left a big mark at the test." Stenzel co-owns Digi Craft Agency www.digicraftagency.com and has been using every tool and resource to help bring a more realistic return on investment for sponsorship partners. "Sponsors today are most concerned about receiving a return on investment and that�s what the Digi Craft Agency specializes in," said John Baxter, Director of Marketing and Advertising at Digi Craft. "We build performance based campaigns that work for our clients, they can track and see their return and in-turn they earn trust and faith in what we do." The team hopes to extend these services to sponsorship partners through out the 2011 season. ARCA driver, Scott Stenzel, takes advantage of his momentum from a 7th place finish during his first stock car debut at Talladega Superspeedway and is going to be participating in the NASCAR K&N Pro Series New Hampshire 125. Scott's car and team is owned and operated by Jeff Spraker, owner of Spraker Racing Enterprises. Jeff and Scott teamed up together in previous races at Daytona and Talladega for the ARCA Series and they look forward to running at New Hampshire Speedway on September 17th. Scott will be piloting car #37, a Spraker Racing Enterprise Chevrolet Monte Carlo, during his NASCAR debut. 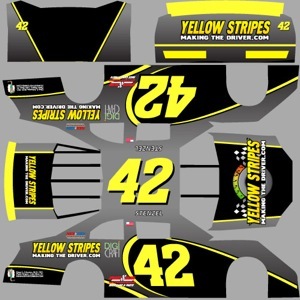 The car will be co-sponsored by Spraker Racing Enterprises and the Yellow Stripes Making the Driver TV Series. Stenzel's marketing and advertising firm, Digi Craft, will be providing an associate sponsorship. 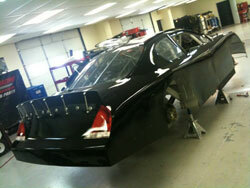 "We are really fortunate to have such a knowledgeable and experienced car/team owner supporting our debut into NASCAR. It's important I get some seat time followed up by a strong finish," stated Stenzel, "To have the support of an organization like Spraker Racing Enterprises helps gives me the confidence I need to run up front." Scott Stenzel�s Agent Charlie Patterson, commented "The deal we put together with Jeff Spraker will help take Scott's career to the next level. He's just gotta stay out of trouble and have a good finish." The race weekend begins September 15th as the haulers will start to unload the race cars into the garage areas to prepare for practice, qualifying and the race. 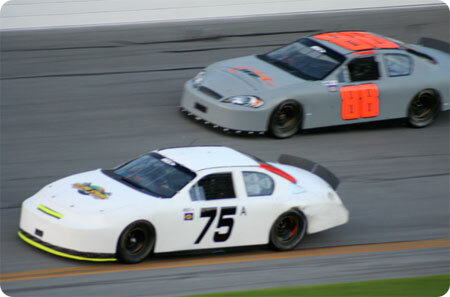 Talladega, AL - ARCA driver Scott Stenzel finishes 7th in his first stock car debut at Talladega Superspeedway. 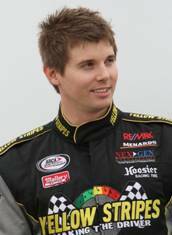 Stenzel, a rookie driver in the ARCA REMAX racing series passed 10 cars in final 2 laps to record a top 10 finish in his first ever stock car race. Stenzel starting the race in the 28th position was Talladega�s highest mover when he passed the finish line in the 7th position during the ARCA REMAX 250 at Talladega Superspeedway. �What was impressive about Friday�s performance was Scott�s ability to avoid two major crashes and catch up to the leaders with 10 laps to go. You don�t see many rookie drivers that come with that type of determination or poise in a debut race,� said Agent Charlie Patterson. Before the race Team Stenzel, faced adversity, when a last minute crew chief change could have proved to be very costly. Crew Chief, Jeff Spraker was unable to make the race, which gave David Efft, control over Team Stenzel. Efft�s experience includes winning Talladega 5 times, was a former crew chief for Darrel Waltrip, Cale Yarborough and Buddy Baker.��I really enjoy working with these young guys, even after being retired, I am still finding enjoyment in bringing up new drivers,� Efft stated after the finish, "Scott ran a very smart race and he exceeded my expectations, he has everything it takes to make it in racing, talent, drive, determination and charisma." Scott Stenzel�s Agent Charlie Patterson, commented "Listening to experienced spotter Greg Newman was so very important, and Scott did just that. I am very proud to be a part of his 7th place finish." Stenzel had this to say after the race, "This is a dream come true, our goal was to finish the race. Dave said that if we finish we'd be in the top ten, but I never thought we'd be in position to possibly win the thing. What a day! I learned a lot behind the wheel and am excited to work with the same people again. I give all the credit to such a experienced team. Finishing 7th was like a win!" 3 31 Tim George, Jr.
TALLADEGA SUPERSPEEDWAY: DRIVER SCOTT STENZEL, "SURROUNDED BY A WINNING TEAM"
Building a winning team has been the main focus of the 2010 season. The Yellow Stripes Making the Driver program has allowed ARCA Driver, Scott Stenzel, the opportunity to work with the best in the industry as he makes his superspeedway debut in Talladega. The staff at Digi Craft produced this paint scheme for the Lucas Oil 200 at Daytona International Speedway. "We have surrounded Scott with a winning team full of Veterans. Our goal is that one day we hope Scott will be that elite driver you hear about every weekend in the Cup and Nationwide series." 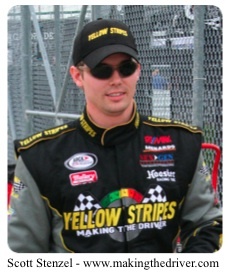 John Baxter, Yellow Stripes Making the Driver Series Executive Producer. Scott, under the watchful eye of crew chief/team owner, Jeff Spraker, took full advantage of the March 23rd Test Session to shake down the #42 Yellow Stripes Making the Driver Ford Fusion. Under the hood, a Roush/Yates prepared engine has been tagged to provide all the necessary horsepower for Scott and Team to conquer the venerable high banks of Talladega as the #42 Ford Fusion aims to garner a top Five Finish in the ARCA/ReMax 250. The race is scheduled to take place Friday, April 23rd with LIVE telecast on SPEED TV at 5:00 PM EST. Race-day at Talladega will see Jeff Straker manning the war wagon as Crew Chief / Team Owner for the Yellow Stripes Ford Fusion. Jeff has over 20 years winning experience as both driver and car owner in NASCAR� as well as ARCA. "Testing at Talladega was most important for Scott. He did a great job giving feedback for his first time at the superspeedway," Jeff commented. "We are going to do everything we can to help Scott do well during the race. He has a lot of people in his corner and we want the best for him." Nick Ramey, from Roush/Yates Engines, has leant his considerable expertise to the Yellow Stripes team to make sure that the #42 Ford Fusion engine will lay some serious horsepower onto the �Dega superspeedway pavement. Greg Newman, father to NASCAR Driver Ryan Newman, was spotter for Ryan's historic victory at the Daytona 500. Greg will be manning the spotter stand for Scott's assault on Talladega. Charlie Patterson with NexGen Motorsports has been developing Scott's career over the last few years, "Working with Scott has a lot of the qualities similar to other drivers I have worked with, like Ryan Newman, and I believe Scott is ready to make it big in the racing world." "Scott is one of the most impressive young drivers I've seen in a long time," says Dave Bowman, creator of Two Guys Garage and Shade Tree Mechanic seen on SPEED TV. "He is the complete package. He is a very talented driver and is adept at representing a sponsors interests both on and off the race track. The Yellow Strips television series tells his story about the struggle in making it in stock car racing and is a brilliantly crafted." "I'm really excited about returning to superspeedway racing. After not making the field at Daytona, we learned a lot, not just as a team but as a driver, too." Scott stated regarding the upcoming race, "My main goal is to stay focused, out of trouble and be as consistent as possible. Hopefully we'll have a solid finish and look good to our fans and sponsors." When "Yellow Stripes: Making the Driver" agreed to sponsor his car, Scott then approached Jeff Spraker Racing to finalize the Daytona assault. Jeff and his crew have been working on preparing Scott's speedway car purchased from the Wood Brothers and powered by a Roush/Yates motor. On January 22nd, 2010, Scott made it official when he entered his #42 Ford Fusion into the Lucas Oil 200 @ Daytona with Jeff Spraker agreeing to sit atop the war wagon as crew chief all throughout speed week. When asked about preparing for the upcoming event, Scott commented, "I can't thank everyone enough for helping out a rookie driver. Jeff Spraker and his skilled crew have taken me and this Wood Brothers Ford Fusion on at the last minute. Everything is coming together smoothly with everyone pulling extra duty. Plus, as a team we've been able to gel. Spraker's been to Daytona several times. He knows what it takes to lead and finish up front, but he's yet to win one. Now, we share the same goal - to win at Daytona." Who says a small town farm boy can't achieve all his dreams. All it takes is a lot of tenacity, talent, dedication and the unquenchable need for speed. Scott Stenzel is well on his way to finally realizing his lifelong goal. To compete and win back his racing career. And, he still has his sights set on the greatest dream of all - "to Win at DAYTONA." 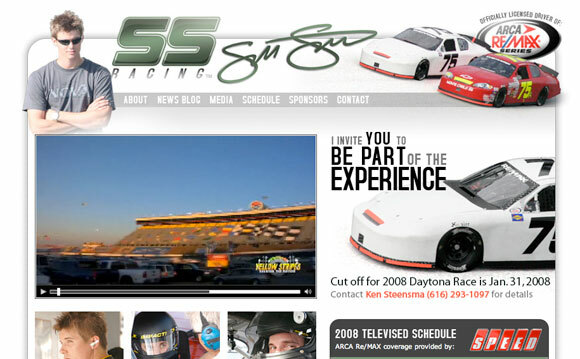 Scott participated in the open test at Daytona International Speedway December 18-20th, 2009. He drove the Bob Schacht Motorsports Chevrolet during the test event. The first day of testing was shortened by rain so they had to make up some ground during day 2 of testing. Day 2 of testing allowed Scott to put up some solid times ranging from 50.5's to 50.2's. He also was able to get some experience in the draft. The photo you see here is Scott Stenzel in the 75 and Danica Patrick in the 88. This was Danica's backup car for the race weekend. Scott and Danica were participating in a late afternoon draft session to end day 2. As President of Orlando-based web development company Digi Craft, Full Sail Computer Animation grad Scott Stenzel has seen his fair share of success in the industry, servicing 125 clients both locally and nationally, including Disney, NBC/Universal, Live Nation, and GRAMMY®-nominated recording artist Mary J. Blige. But long before he entered the world of 3D graphics, website maintenance, and advertising, Scott had another huge passion in his life: race car driving. And now, through an initiative stemming from Digi Craft's partnership with digital media agency Gen2Media and Charlie Patterson (president of NextGen Motorsports), Scott is getting a chance to live out his dream; he'll learn how to become a professional race car driver as he stars in his own upcoming reality television show, Making The Driver. Scott films on set of "Yellow Stripes Making the Driver"
The producers of the new reality documentary, "Yellow Stripes Making the Driver," has been filming Scott's progression into the limelight of motorsports. They've done a wonderful job at capturing the Real World events that take place along the way of any aspiring driver. Scott was able to get some time to talk with Ryan Newman and hear of his success as he worked his way up through the ranks. This is a screen capture from the footage when Mike Loescher was letting Scott know what kind of cars he'd be testing at New Smyrna Speedway. There were some very interesting moments that you'll have to watch for when they release the first episode. Charlie Patterson got Bob Schacht and Scott Stenzel together to discuss combining their efforts for the 2010 ARCA Daytona 200. Bob was very excited to hear of Scott's great success with the Yellow Stripes TV show and felt good about Scott's continued loyalty to Bob over the years. Scott really feels comfortable working with an organizations like Bob Schacht Motorsports. They are very well put together, they know what they are doing and they can win races. Bob's been around this industry enough to not only have some of the best equipment but to be very experienced in what he does. Scott also added that it's easy to talk with Bob since he used to be a full time driver himself, so there should be an easy line of communication during speedweeks 2010. Today marks the first day in history for Scott Stenzel Racing. We have officially earned one of our first sponsors, at this level, for auto racing. Over the years Scott's had many local sponsors that have helped him keep turning laps but none that were able to come up with the money needed to run the full race at Daytona. We are very happy to bring them on board. We will release all the information at a later date once we have all our advertising and marketing elements in sync. The launch of my new site was a very large undertaking. To best describe your talent and the nature of your business when talking about yourself is a very hard task. I really appreciated the guidance and help from Tyler Gaw, my lead web developer and Peter Olach, from NexGen Making the Driver, for pointing me in the right direction as what to say and how to arrange my business online. The videos you see within my site are done by the infamous Hector Ortiz. He is my business partner in Digi Craft and has done a wonderful job at portraying the on and off track experiences of a professional car driver. If anyone is wondering where you can get a video like this or a web site like this just call Digi Craft 407-249-0622 and one of their knowledgeable staff members will be happy to point you in the right direction. Thanks again to all who has made this possible! My hometown, Alexandria, MN, wrote up an article about my career and the pursuit of a sponsor for the 2008 season. Tara Bitzan did a wonderful job writing this article. I had a lot of feedback, mostly from high school friends, from the publication. Click on this link to download a PDF version of the article (size - 1.3MB). Or go directly to EchoPress.com where they posted some of the photos from the article. This was a weekend that I will never forget. It was the first time I have ever been around Daytona at the wheel. I have been around the track in passenger cars but never at the speed I posted that weekend. I always told myself that the first time I will be driving around Daytona I will do so at 180 mph! Well that dream came true! I was lucky to have such a great car from Bob Schacht Motorsports as well as a great crew. Also it doesn't hurt to have a guy like Charlie Patterson at your side making sure everything went smooth. Also be sure to watch the in-car footage of my last 10 lap segment. It was an awesome weekend! Copyright © 2019 Scott Stenzel Racing, Inc.